Ask any product manager and they will tell you that seeing and talking to their users is critical to success. Yet few walk the walk and in effect, they are flying blind. People building products sweat and toil over what features to build. We all know that great product design requires hard trade offs, that we can’t build everything we want to, that very tough prioritization and scoping decisions need to be made. Yet if you analyze the time spent deliberating over these decisions, versus the time spent informing those decisions with data directly from users, the latter comes in a poor second, a long long way behind. As someone running a product and design team, this is crazy to me. I think it’s largely because people consider talking to their customers as very time consuming, taking a lot of upfront work, and that it can’t be fast, continuous, and informal. But that is an outdated view, anchored in a world where fast tools didn’t exist for easily talking with your users. If you ask most Product Managers when they last spoke directly with one of their users, the answer will often be weeks ago, sometimes months, and incredibly, sometimes the answer will be that they never have. They looked at analytics, or outsourced research, but they have never engaged in conversations directly. Many product managers will pore over analytics as a proxy for talking directly to users, or as a way to understand what their users need. This is like the shop owner staying in his office, poring over spreadsheets, rather than getting up and walking through the shop floor, observing what is happening and talking to customers. The problem with analytics is that it tells you what people have done, but not why they did it or how they felt about it. It also abstracts people into numbers, removing all the critical nuance and subtlety, and worse still, removing the ability to empathize with people’s situation. This empathy is critical when designing the little details in products. A second problem with analytics is that the data makes it hard to know what to do next. To know what to change. Is the next step small product tweaks? Or is a large redesign needed? 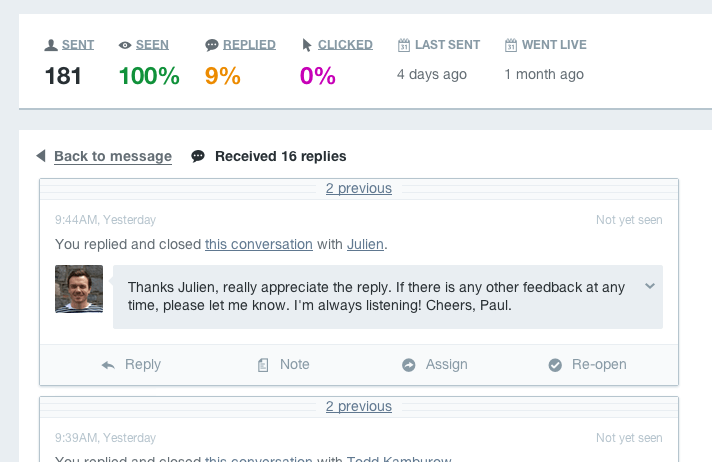 At Intercom, all our Product Managers and Designers talk to our users continually. We average speaking to between ten and twelve different users a week each, but it is often many more than that. It is habitual to be in conversations with our users, better understanding what they need and why, and where Intercom falls short. Unsurprisingly we use Intercom to do this. Since joining Intercom just over a year ago, I can’t imagine designing and building a product without using Intercom. Yes, I’m biased, but if I left Intercom to work on another product, the first thing I would do is install Intercom. I think you should too, let me explain why. I’ve been in multiple situations in our company where the product team are debating whether a feature is important, what problem it solves, or how people use it. Then someone turns around and says ‘let’s find out’. They filter our users to people who have used that feature recently. This takes 10 seconds. They then message them asking them what they last used it for, what worked well, and what could be better. This takes about a minute. Immediately, those users see this as an in-app message whilst using Intercom. Minutes later the responses start coming in. Suddenly the product conversation is much richer, there are examples, there is data. It is no longer conjecture. Using Intercom to design and build Intercom allows us to really understand what our users need. We talk to people directly. We’re engaging in conversations to really understand things. Following up with people, getting more details and clarifying things. You can’t do this with analytical tools. When we talk to our users, we always understand their context. Because Intercom is an integrated tool, with one user record for all their activity in your app, we can see all the things they have or have not done, we can see things like when they signed up, how often they use Intercom, when they last used it, what features they use, and critically we can see past conversations we have had with them. We only ever talk to the right people. We filter and message very specifically to ensure that we’re not spamming our users, or blindly asking them to fill in a survey. We get very accurate accounts of what people have done. Memory is fallible, so we add time filters to ensure behaviour is recent, and people can accurately remember what they did. We also often trigger messages on specific pages of the app, and use in-app messages rather than email, so we are only asking people when they are in the act of using a particular feature. They are right there, in the moment, so this is much more accurate data for us, not to mention a much less invasive experience for our users than us filling their email inbox. Take off the blindfold. Get talking to your users for free in minutes. 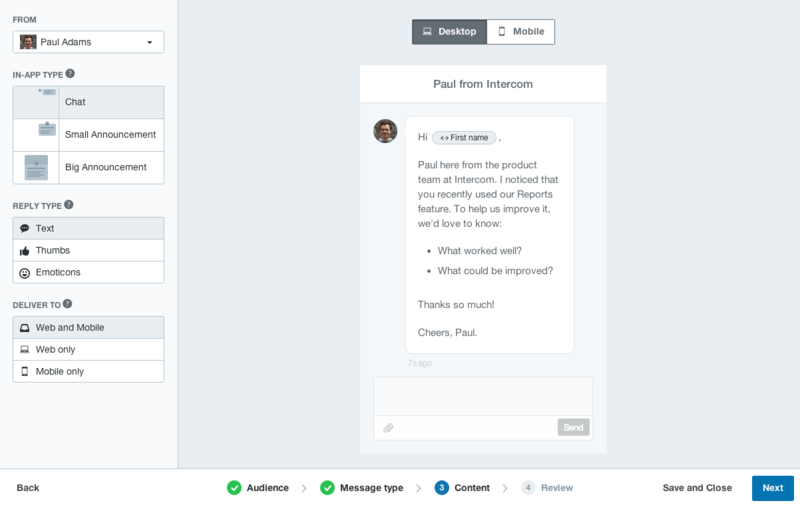 If you are designing and building products, and don’t have the ability to easily and quickly talk directly to your users, I strongly encourage you to try Intercom. It takes minutes to set up, and the first month is free. You have nothing to lose, and I’m confident you won’t regret it. Let’s not fly blind by relying on analytics alone.